Distracted driving penalties to be reviewed in B.C. B.C. 's Attorney General Suzanne Anton has launched a public consultation into whether the penalties given for distracted driving should be raised. B.C. 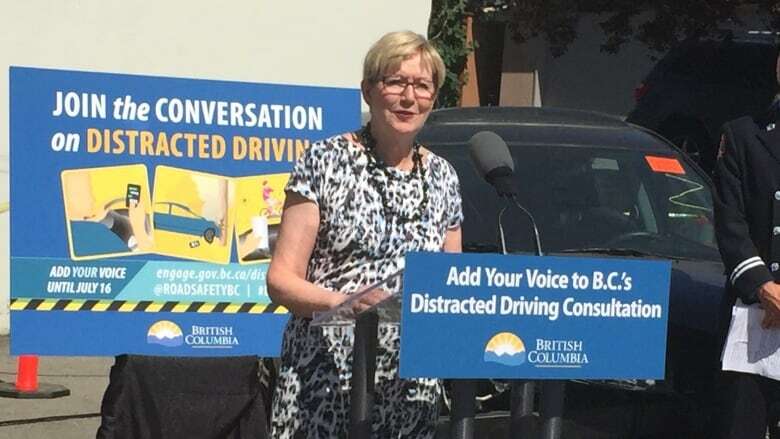 's Attorney General Suzanne Anton has launched a four-week public consultation into whether the penalties given for distracted driving should be raised. In 2014, police in B.C. wrote more than 50,000 tickets to drivers who were using an electronic device while behind the wheel. That's about 2,000 tickets more than were issued in 2013, according to ministry statistics. "The problem is not going away," Anton said on Tuesday as she announced the consultation, noting that the government is aiming for B.C. to have the safest roads in North America by 2020. "We took a first step and increased the penalties last fall and now we're looking at possible changes to the legislation, including more severe penalties,' she said. "We want to ensure these are set at a level that is fair and effectively changes behaviour." The government is now asking for the public's suggestions on beefing up existing distracted driving laws and potentially raising the penalties. It has created a new website where people can voice their opinions for the next month. According to government statistics, at any given time in the province, an estimated 9,500 drivers are using a hand-held electronic device, with 40 per cent of those texting or emailing while driving. B.C. NDP Justice Critic Mike Farnworth said he's disappointed with today's announcement because he thinks the government should be cracking down harder on "idiot" distracted drivers. "I expected more than a hashtag consultation. I was expecting some leadership shown and some action taken," he said. "We know what the problem is. Distracted driving — people texting, people using cell phones while driving — kills people. There's nothing to consult on." Farnworth said today the government should have followed the lead of other provinces and announced significant penalty increases for distracted drivers. "The only way to change behaviour is to make it socially unacceptable, and one of the key ways to do that is to hit people where it hurts: in the pocket book," he said. "For those people who don't get the message, those people who think that somehow that their conversation is more important than somebody else's life — that repeat offender — they should face a very stiff fine." ​Penalties for distracted driving vary from province to province. Ontario recently passed legislation to raise the maximum fine from $500 to to $1,000. Meanwhile, B.C. 's fine of $167 is the second-lowest in Canada. Below is a complete list of distracted driving fines across the country, according to the B.C. government. Note that Nunavut is not included on the list because it does not have distracted driving laws.